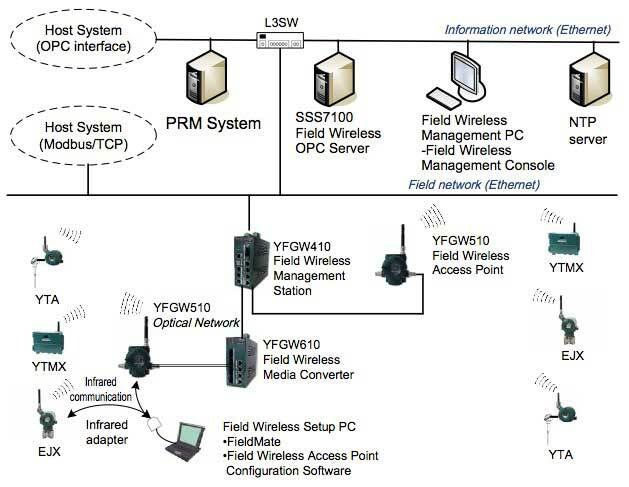 In July 2010, Yokogawa became the first vendor to offer Field Wireless solutions based on the ISA100.11a standard, by releasing the YFGW710 field wireless integrated gateway, and the wireless pressure and temperature transmitters. In 2012, as field wireless becomes more popular, a high performance gateway that can support a large number of devices was required. Therefore in July this year, Yokogawa expanded the wireless solution lineup with the enhanced YFGW410 Field Wireless Management Station and its supporting devices. On the other hand, as the usage of field wireless solutions for plant control and monitoring grows, there is a pressing need for the plant asset management software–Plant Resource Manager (PRM)– and the device configuration system–FieldMate– to support the management and maintenance of field wireless devices. This paper describes the new functions that have been added to PRM to fulfill this requirement. As compared to Distributed Control Systems (DCS) such as CENTUM VP that monitors the operations of the overall plant, PRM1 2 is a type of Plant Asset Management3 (PAM) software package that primarily focuses on the maintenance of devices and instruments. Device master function (master data) for maintaining an asset database. Plug and play function for registering devices automatically. Audit trail function for device alarms, events, user activity, and so on. Online device health monitoring (e.g. Device Patrol, Device Diagnosis). PRM fully supports communication standards such as HART, FOUNDATION fieldbus™ (FF-H1), PROFIBUS, and FDT/DTM (Field Device Tool/Device Type Manager4) interface standards. On top of that, it is equipped with a plant hierarchy display function that is based on the IEC61512/ ISA-88 standard. However, with the advent of the ISA100.11a standard, PRM had to be enhanced to support this standard too. 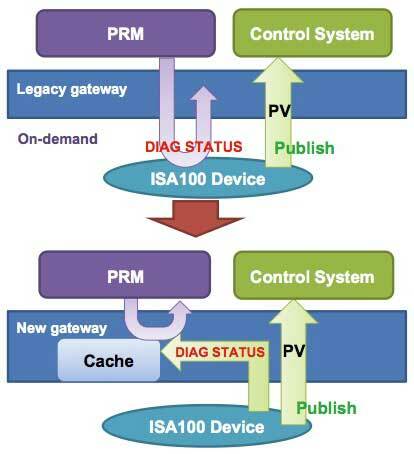 The following sections describe the details of the enhanced PRM modules, and the roles they play in realizing ISA10 0.11a support. Figure 1 gives a high level view of the configuration by which PRM communicates and manages devices. The blocks in purple indicate the PRM systems while the remaining blocks indicate other systems and devices. PRM Client is a human machine interface (HMI) application that is used to manage all assets according to the ISA-88 plant hierarchy model. Higher hierarchy levels of the plant such as Site or Area are used to logically compile physical devices and instruments. Many of the functions mentioned earlier are provided by this application. On top of that, the following functions are also provided. 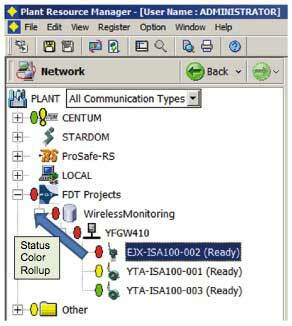 Parent nodes in Plant view will adopt the color-coded status of all lower level devices, including field wireless devices. Green indicates healthy while red indicates failure. Device status can be categorized and prioritized based on NAMUR NE107 recommendations5. Maintenance alarm messages contain guidance information such as alarm contents, cause, and recommended actions. DTM Works, where FDT/DTM technology is used to view device-specific status in real-time, or perform device diagnosis such as checking of battery levels. PRM Server and the Field Communication Server is responsible for functions such as master data storage, plug and play device registration, data acquisition, device status scanning, and online device communication. A PRM Database that is built on top of an MS SQL Server for storing all data. Periodic and on-demand data acquisition. Scan and monitor the healthiness of all devices, including field wireless devices. An Alarms & Events (A&E) function used to acquire the various alarms and events raised by field devices. The acquired events are translated into user-friendly maintenance alarm messages that users can monitor, enabling maintenance personnel to take action more easily. Supports multiple communication methods at the same time. Ability to use any vendor's CommDTM/ Gateway DTM that conforms to FDT. Ability to use CommDTM as the communication driver for connecting to wireless gateways. Quick support for gateways that provide DTMs, without developing any programs. A clear advantage of DTM technology is better interoperability. PRM can communicate with devices of HART, FF- H1, PROFIBUS, and devices that conform to the ISA100.11a standards. The communication can be performed through control systems such as CENTUM or STARDOM, or through Ethernet or HART multiplexers from field gateways that adopt DTM technology. This paper describes PRM architecture, with a focus on communication with field wireless devices using DTM, and handling of large scale networks. Caches the device status which is published periodically from the field wireless device to the new gateway together with the process data of that device. Saves PRM from having to periodically request field wireless devices for their device status, thereby preserving the communication bandwidth for other purposes. Ensures redundancy for field wireless networks by using Duocast, which sends data through two paths at the same time. Monitoring of device statuses continues even when one communication path is interrupted. Provides additional reliability with a dual wireless backbone network. Diagnostic and process data from field wireless devices is seamlessly switched to the standby gateway automatically, without further reconfiguration of the network. The system configuration in Figure 2 illustrates how the new gateway communicates with field wireless devices through YFGW510 Field Wireless Access Points. The new gateway provides two enhanced features over its predecessor (YFGW710), and these are used in managing PRM field wireless devices. Increased support up to 500 devices (the predecessor supports only up to 50 devices). A built-in cache to improve data acquisition performance for host systems. When host systems such as PRM supports a large number of field wireless devices, problems in data acquisition occurs as the communication speed of wireless devices is slower than wired devices. As a resolution for this issue, a memory cache was built into the new gateway during ISA100.11a gateway development. The cache can be configured using the Field Wireless Management Console (refer to Figure 2). With the cache, the new gateway can periodically acquire the self-diagnostic status of some or all of the 500 connected devices, and store the values locally so that they are readily available to any host system when requested. There is also a cache expiry policy to define when to automatically refresh data that is older than a specified time range. When PRM requests for data, the new gateway will determine the validity of the data. If the data is new, the new gateway will send the data from the cache, if the data is old or not cached, it will acquire the corresponding data immediately from the devices. This design improves performance with minimal impact to existing systems. Figure 3 shows a comparison of the new and legacy gateways, with and without cache support. On-demand communication is not very efficient for field wireless devices. Therefore as shown in Figure 3, communication performance can be improved by avoiding such communications. In addition, by utilizing the cache, the on-demand communication bandwidth can be preserved for other purposes. Field wireless devices can also reduce battery consumption since they do not need to respond to on-demand requests. With the intelligence of current field digital devices, one main function such devices offer is the self-diagnosis function, which provides diagnosis alarms or self-diagnosis status. PRM depends on this data for its own device health monitoring logic. As the required device diagnosis parameter is automatically cached by the new gateway, users only need to select the candidate devices for self-diagnosis based on their criticality level. Even though the new gateway is designed in such a way that only minimal changes are required in host systems, there was a need to enhance certain designs in PRM systems in order to fully maximize the new gateway features, as described below. In the current design, PRM Client is responsible for using the Plug & Play function to register devices online through the FBCOM. FBCOM automatically performs DTM communication for hardware that only supports DTM communication (e.g. 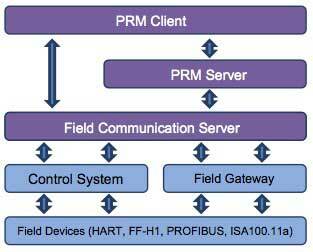 PROFIBUS and field wireless devices). This communication is enabled by the custom network topology configured by users during PRM engineering. The device registration data (including communication capabilities) is then stored in the PRM database, which will then be used by the PRM server data acquisition engine. PRM Client has now been updated to acquire and store information about the new gateway. Devices connected to the new gateway can utilize the cache, and the scheduling of data acquisition by PRM Server can be altered to cater to this enhancement. One of the main purposes of the PRM Server is device status monitoring. PRM Server uses a scheduler to periodically acquire device status information, and use an internal status decision engine to organize the information into different color codes. The various views in PRM Client will display the color coded information on all hierarchy levels. This enables users to quickly identify faulty devices. Figure 4 shows the field wireless device hierarchy in the Network view of PRM Client. Notice that the faulty device status is displayed on all parent nodes. Depending on the number of devices connected, the scheduler can scan device statuses at intervals of 10 minutes to 24 hours. With the additional information (such as cache support) recorded during device registration, the scheduler can reduce the turnaround time of data acquisition for each device connected to the new gateway. In this way, the current scan specifications can be maintained even if the number of devices connected to the new gateway increase by tenfold. FBCOM can specify whether to use the cache when requesting data from the new gateway. If turnaround performance is important, FBCOM can hold on to the DTM connection to a device, but this leads to faster battery consumption in field wireless devices. Alternatively, FBCOM can use the disconnected model to acquire data by connecting only when certain data is required, and immediately disconnecting after the data is acquired. This extends the battery life. FBCOM has also been enhanced to support the WirelessHART™ gateways. This support is realized in the same manner as for ISA100.11a gateways, using DTM technology. This paper has given a brief overview of the various PRM systems, and the roles they play in realizing the functions for managing and communicating with HART, FF-H1, PROFIBUS, and field wireless devices. The functions were implemented using FDT/DTM technology. This enables prompt support of new hardware (Yokogawa or third-party devices) as long as the required DTMs are made available. As FDT/DTM technology matures, it will form the basis for such new hardware support in the future too. CENTUM, PRM, YFGW and FieldMate are registered trademarks of Yokogawa Electric Corporation. HART, WirelessHART are registered trademarks of the HART Communication Foundation. FOUNDATION fieldbus™, PROFIBUS, Ethernet, and Microsoft are registered trademarks of the Fieldbus Foundation™, PROFIBUS User Organization, XEROX Corporation, and Microsoft Corporation respectively. All other brand names, product names, titles, and copyrights used in this paper are either trademarks or registered trademarks of their respective holders.